But if you’re in for a reality fix, read on. With time, we all get expression lines on our face. While, moisturizing does help in reducing dryness and thus help in making these lines less visible or deep but in no way moisturizers can help prevent or treat wrinkles. Up until my 30s, I had a beautiful relationship with my skin. I was diligent with moisturizing and my skin reciprocated in being bright & glorious. Comes my early 30s and the relationship started to get a bit complicated. From normal skin, it turned into combination with little bit of pigmentation and dark spots on both sides of my cheeks. Selection of products became difficult and I had to put in extra effort to keep the dullness away. But yet, it looked charming and youthful. It wasn’t until my 37th b’day, when mother nature suddenly smacked me in the face. Fine lines started showing up out of nowhere. Dark spots became darker and deep as if trying to find a permanent place on my face. It was then I realized that moisturizing isn’t enough. Sunscreen isn’t enough. Vitamin C isn’t enough. In fact, all my skincare super stars aren’t enough, when it comes to fighting the signs of aging or fading deep seated wrinkles and dark spots. I have to do something different, something radical, if I really want to improve my skin. Anyone fighting the signs of aging or acne. Which means all those struggling with large pores, fine lines, wrinkles, dark spots, pimples, acne, and acne scars. If you’re under 30 or in early 30s with normal or dry skin, you don’t need it. But if you’re over 35 or in your 40s, you must consider this. Preservatives, parabens, colorants and fragrances. But since retinol is a strong ingredient that may cause breakouts, dryness, or peeling skin in some cases, user discretion and caution is advised. Retinol in high doses is best used under a dermatologist’s supervision. 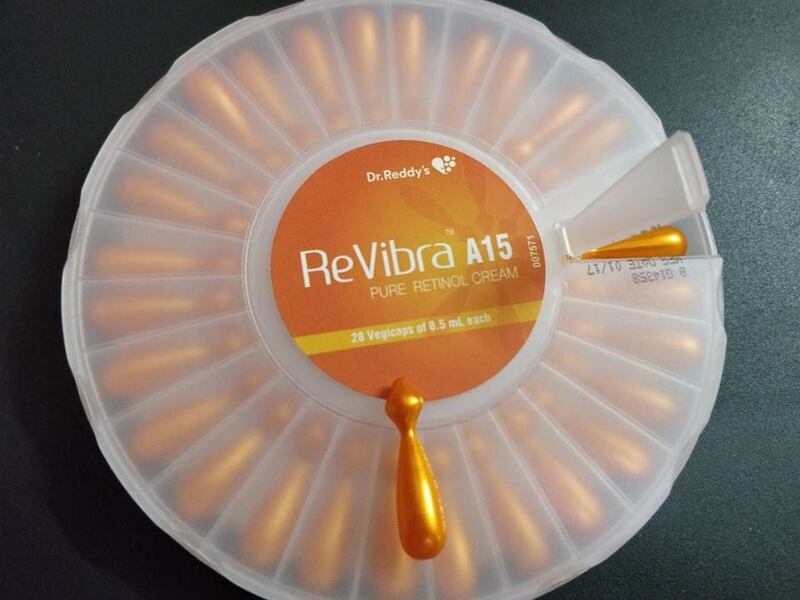 Dr. Reddy’s Revibra A15 Pure Retinol cream is however a gentle version in low dose, so a strong reaction to this particular retinol product is highly unlikely. 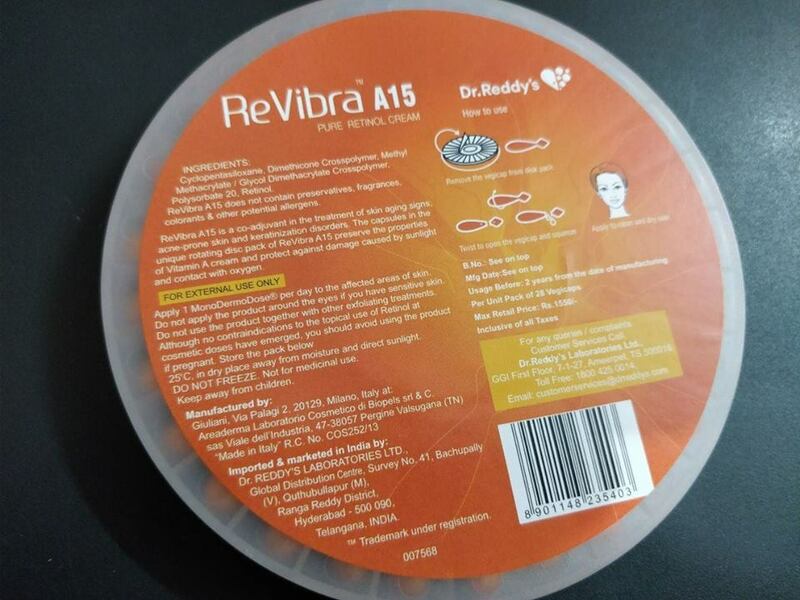 Any precautions to take while using Dr. Reddy’s Revibra A15 Pure Retinol Cream? As retinol is potent antioxidant and exfoliant, it’s advised not to use too much exfoliating products while using retinol. Also, retinol has a tendency to make skin photosensitive, so don’t forget to put on your sunscreen every morning, when you are using retinol based products in the night or day time. It’s transparent or clear in color with soft, fluffy gel like texture that feels more like a serum than a cream. The product is fast absorbing and spreads nicely without leaving any film, residue or shine behind. It’s almost like wearing nothing on your face! Comes in a rotating disk packaging containing individually enclosed 28 vegi capsules each containing 0.5 ml of pure retinol. Apply contents of 1 capsule in the night after cleansing. Wait for 5 minutes and then apply my regular moisturizer or night cream over it. INR 1550 for 28 vegicaps. Each capsule contains 0.5 ml of pure retinol cream. As a proven, one of the only skincare ingredients to rejuvenate skin, this prescription retinol comes out fair on all its claims. 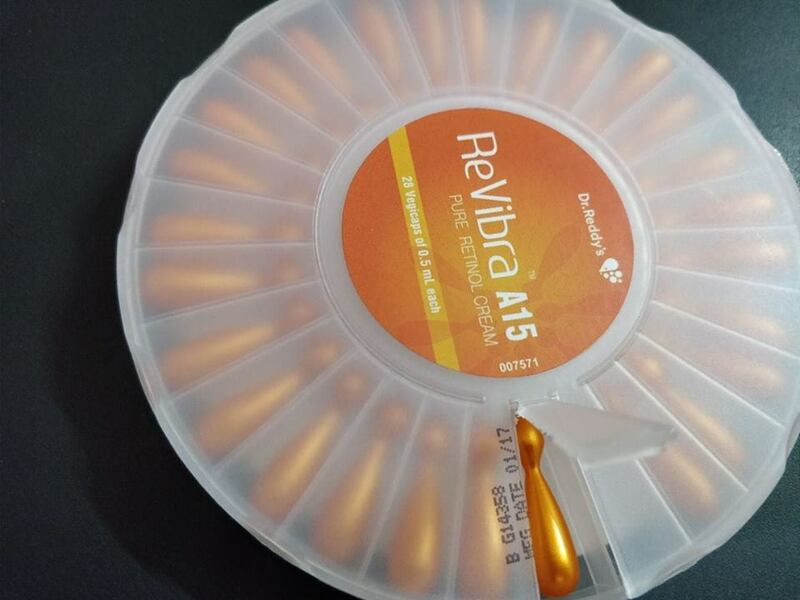 The best part about Dr. Reddy’s Revibra A15 Pure Retinol Cream is that it comes packaged in capsule form in just the right quantity required for single use application on face and neck. Since, retinol is a highly sensitive ingredient prone to degradation on account of exposure to light, air, dirty fingers etc., the encapsulation form ensures that you get the freshest and most potent retinol compared to retinol serums in droppers or pumps, each time you use a capsule. No wonder, encapsulated disk packaging extends the shelf life of the product giving you more value for money. After one month of consistent usage, I can say for sure that my skin has drastically improved. My skin looks smoother, more refined with pores and fine lines much less visible than before. Of all the anti aging and other beauty products I have tried so far, this is actually THE one product that seriously worked on my fine lines and wrinkles. I wake up looking bright, fine and refreshed like I used to in my 20s or early 30s! Too costly for a prescription retinol in India. Unlike, a 50 ml bottle that last you a few months at least, this disk of 28 vegi capsules lasts only a month. Which means you have to spend INR 1500 each month for your regular retinol routine. But the results it has given me are indeed priceless! Yes but I’d like to try some other retinol from some other brand to see how that fares vis-a-vis this one before turning into a loyal consumer. In all Dr. Reddy’s Revibra A15 Pure Retinol Cream is a high quality, light prescription retinol product in the market that can truly transform your skin. Do give it a shot, if acne, large pores, fine lines or wrinkles are a big issue with you.